Exhibitors Connection uses a proprietary method to select individuals with the best personality traits and strengths to be our Brand Ambassadors. These individuals are then trained using our decades proven techniques—and it shows. Their dress and grooming is always a cut above. They can handle crowds, different temperaments and fluid situations in stride and with a smile. Below are a few examples of our people at work and our constant focus on training. It's really true that "It's All About the People." 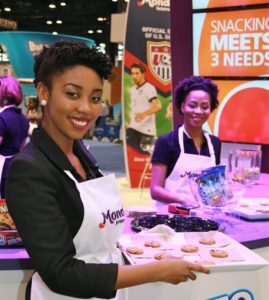 Attendees are warmly welcomed to your booth by our hostesses that positively promote your brand and company. Trained Session Monitors Scan badges while not slowing ingress. 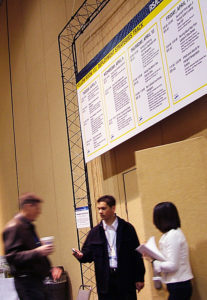 Each of our Session Monitors are trained beforehand to be familiar with your event so they can direct attendees to the right location and offer other helpful assistance. 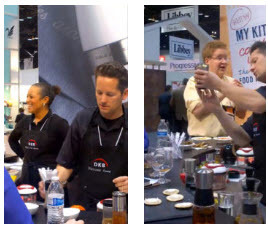 Engaging Product Demonstrators create product awareness in an outgoing, professional manner. Your tradeshow appearance is important to you, and the attendees that visit your booth often receive their first impression of your company from Product Demonstrators. Our Product Demonstrators work to capture the attention of potential buyers by being familiar with information that you provide about the featured products before the show even begins. Since they are the face of your company it's critical that they know your products well and communicate their value with the enthusiasm and professionalism that you would. As a Certified woman owned corporation, the business continues to thrive under the direction of its original owners. To consistently provide responsible and outgoing Brand Ambassadors to represent our clients…. nationwide. Exhibitors Connection has always focused on their commitment to diversity, qualifying individuals that have the personalities and professional presentation that our clients are looking for. 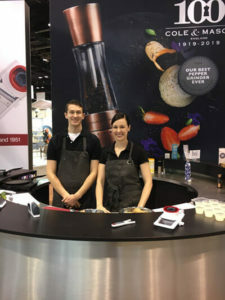 The people that qualify to be part of the Exhibitors Connection team come from a variety of backgrounds and ages. We are proud to engage in diversity-positive business practices and appreciate clients that share this outlook. Thanks for your message! We’ll reach out very soon.